I have self-sabotaged my latest pair of crochet socks - July's Bluebell from Rohn Strong's 2016 Sock Club by carefully swatching but then putting the wrong sized, too large, but similarly colored hook in the project bag and then getting on a plane from Edinburgh to Chicago and making almost a whole sock without realizing my mistake. Arrgggh! Here is the resulting still wearable, extremely cozy but tad too large sock #1. 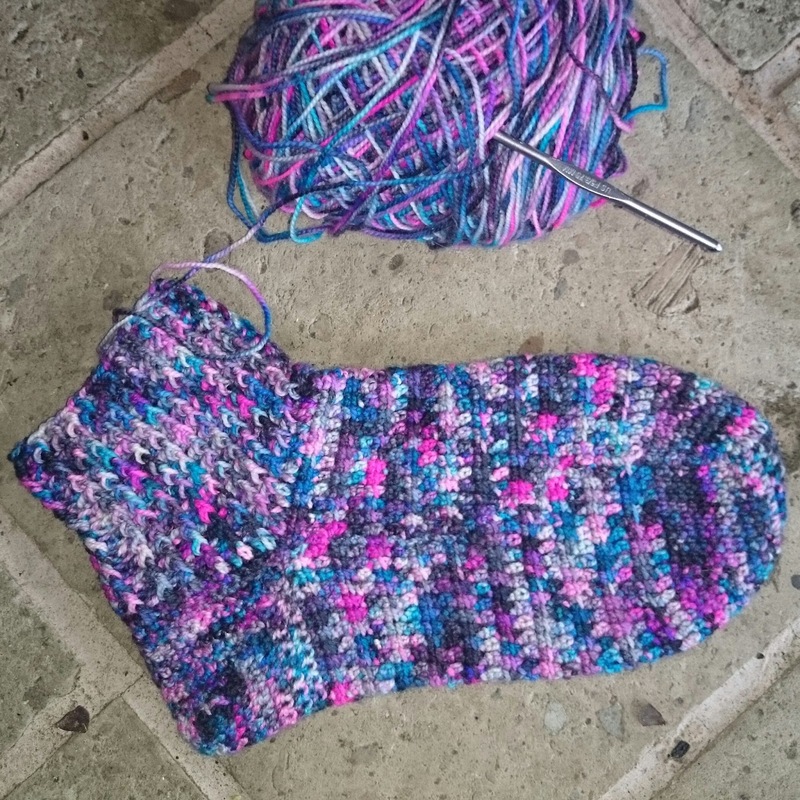 I was introduced to a brand new stitch - linked double crochet which seems to lend itself well to sock construction. It's as stretchy as double crochet but dense like single crochet and makes quite an attractive horizontal ridge. The yarn is WSK Western Sky Knits - another wonderful hand-dyed marvel purchased at the Houston Fiber Fest. How I do love scrummy yarn from indie dyers! And fantastic news - I actually managed to finish TWO pairs of socks since I wrote about my serious case of crochet sock startitis. Writing that article somehow spurred me onwards to completion. 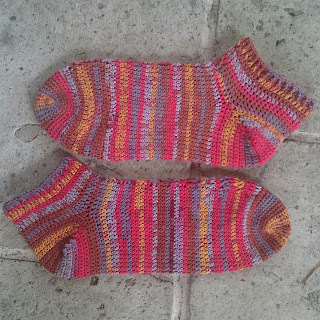 My FIRST ever pair of completed crochet socks are Cabled Socks by Karen Whooley. As a crochet sock newbie her extremely clear instructions helped me get my head around sock construction for the first time. Thank you Karen for showing me the way! My second completed socks are Ribbed Socks by Rohn Strong, a crochet sockalong for July in his Facebook group Crochet Sock Addicts. Being part of a Crochet Along (CAL) motivated me to keep going. 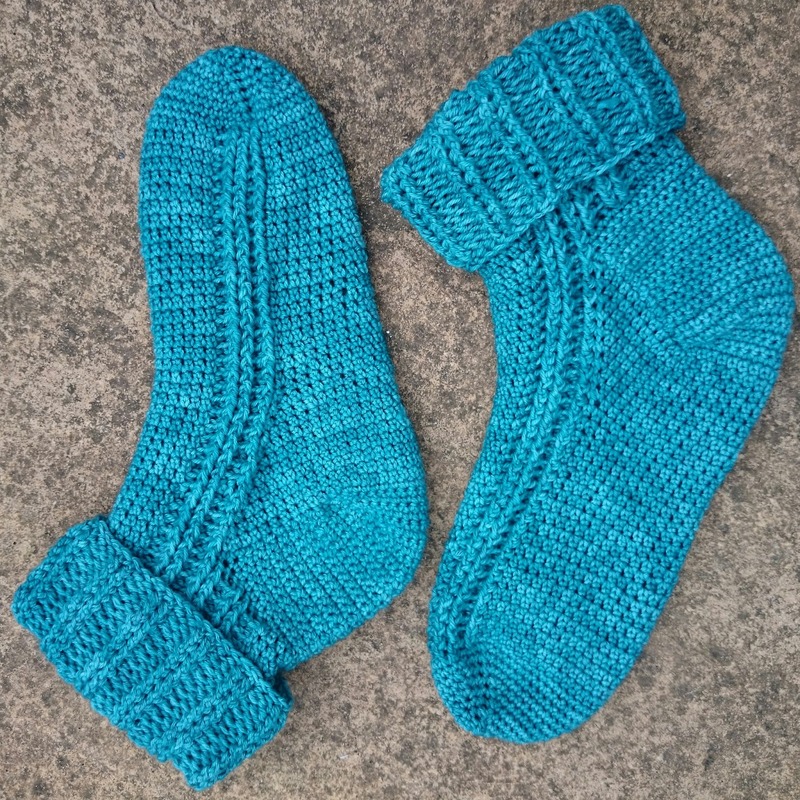 I've written more notes about my completed crocheted Socks on Ravelry: Cabled Socks and Ribbed Socks if this is of interest. I have now developed quite an addiction to crochet socks and I'm feeling ready to start asking family members for their foot measurements! I remember joining the sock club thinking - "one sock a month, surely I won't feel like making them as often as that..." but I've found crochet socks to have just the right amount of challenge, to be the most portable of projects, quick to complete and the resulting handmade sock is so pleasing! 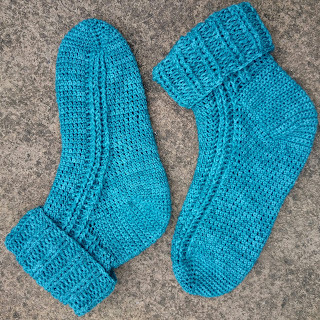 I started the summer looking for the ultimate crochet sock pattern and have discovered there isn't just one pattern but many and perhaps the ultimate crochet project is a sock, well for me anyway! Well your tad to large sock is lovely!!!! You are doing awesome! Socks become addicting very quickly I am learning. It is so great to find something so enjoyable!! Thank you Dianna you're so kind! I'm glad to hear that you're a fellow sock addict too. They are such fun! Yay Jennifer! It's good to meet a fellow crocheter! I think you'll find that crochet socks can be quite addictive when you start! Enjoy!! I really love what you're doing with #craftingismytherapy Thank you for letting me be a little part of it. Thank you for the compliment Amy. I am sure you will enjoy socks a lot once you get going. It's pretty hot here in Houston a lot of the time but we have air con so it doesn't hold me back! I think Ron Strong has a crochet sockalong starting in September on his Facebook group Crochet Sock Addicts. Good luck! Let me know how you get on with your first socks! Thanks Jodie! I'm ready to start another crochet sock now. They are so fun! I'm going to be on a podcast...!